Hi, I’m Maggie and I’m Bad At Winter. I spend November through March April complaining about the cold and doing nothing productive about it, such as learning a new winter sport or moving to a warmer climate. This year, I decided to make some changes to my gear kit to see if it would help me get outside more. The first thing to get upgraded was footwear, and I ended up choosing the Oboz Bridger 7″ BDry Insulated Boots. And hey! My feet have stayed warm! 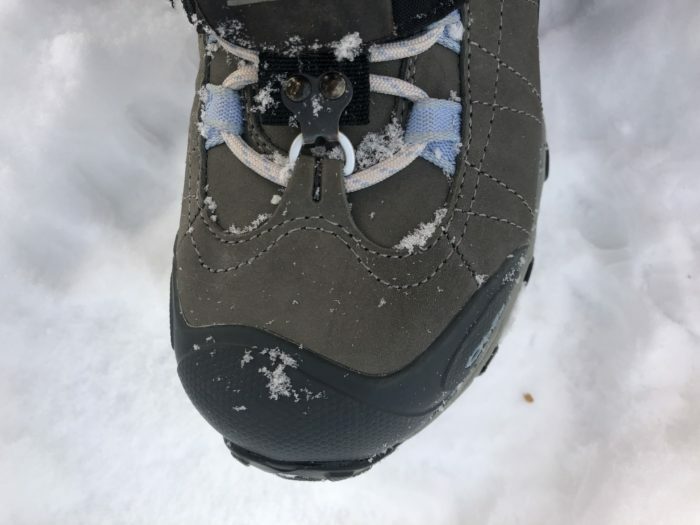 Here are the details on these winter hiking boots. Photo proof I was outdoors in the winter, smiling because my feet were warm. These are your all-around winter boots from a Montana-based company. They fit true to size, keep your toes warm and protected, and are supportive without feeling stiff and constricting. The Bridger Insulated Boots are the winterized version of the Oboz Bridger three-season boots. They come with a beefed-up outsole, wool-accented insole, 200 grams of insulation, and a slightly built-out fit to account for heavier socks. 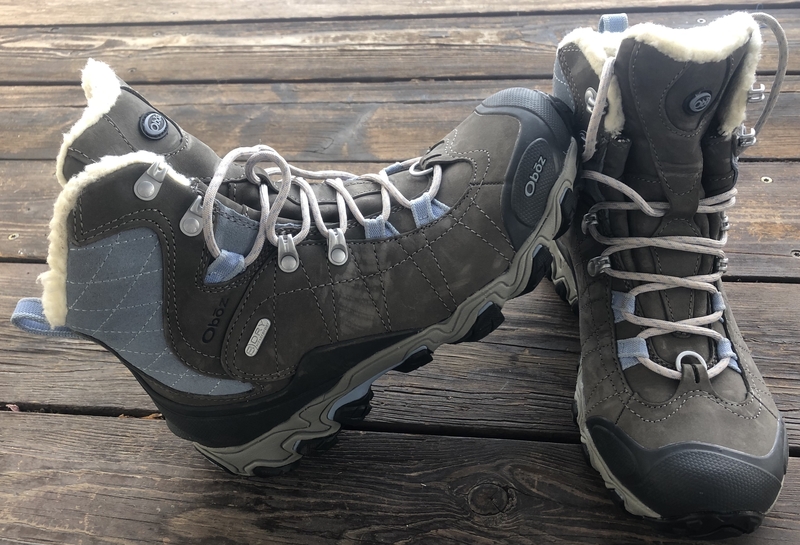 These boots are ideal for staying active throughout the winter and covering miles in the backcountry over snow and through winter conditions. 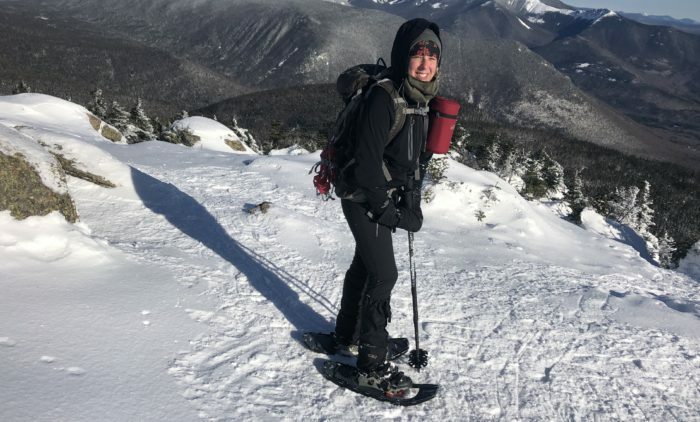 I wore these boots in fierce New England peakbagging conditions, plus drier (but no less cold) snowy Montana hikes over the course of the past two months. Temperatures ranged from lower 30s to about ten below zero Fahrenheit. Snowpack ranged from packed and icy to fresh powder. And a few missteps into stream crossings that did not result in wet feet. I wore them without toe warmers since I wanted to see what the boots were made of. On one long day wearing them (eight hours, zero to ten degrees), my toes only started feeling cold once, and it was around the same time my fingers gave up also. Once I started moving again and dropped off the exposed peak, they warmed up. Obviously, your own experience will vary based on your circulation and overall tolerance for cold weather. Here’s how these boots keep you warm. Insulation: 200 grams of Thinsulate insulation. 200 grams is a safe bet for winter hiking boots. You wouldn’t want to go with less than that, and any more would be overkill for most outings. 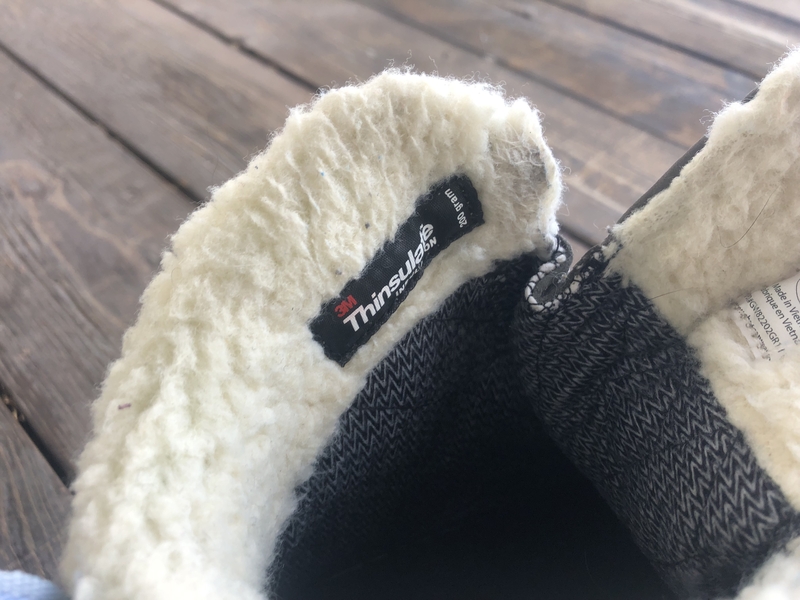 Insole: Oboz uses its special winter insole in these boots, the wool-topped “O FIT Insole Thermal,” for added protection from cold ground. These insoles have a Mylar base layer to reflect heat, and a felted wool top layer. The rest of the insole is the classic Oboz model with ergonomic cushioning, made of three different densities of EVA foam varied based on where they sit underfoot. Outsole: The Bridger Insulated Boots come with a winterized rubber outsole, using Oboz’s “Granite Peak” traction. The winterized rubber formula is softer than three-season varieties, allowing greater purchase and traction on less-than-ideal footing. It grips better in colder conditions, and remains pliable. They fit true to size, and while heavier than footwear I normally wear, aren’t excessive or bulky feeling. 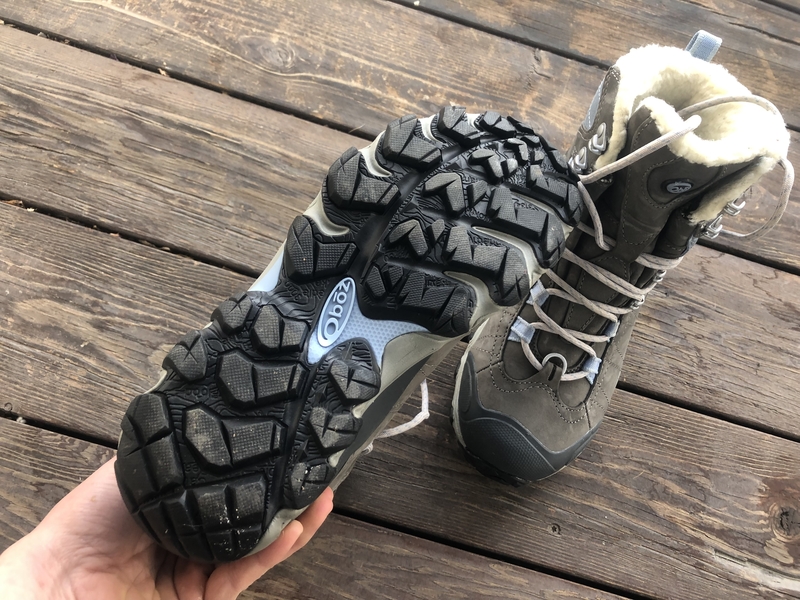 The boots hit the middle ground between being snug enough that you aren’t sliding around or have too much space to heat up, and not too snug to be constricting and make you lose circulation. The toe box is generous, allowing room for thick socks. They lace up snugly around the ankle for support without stiffness, and the heel is molded to prevent slipping. 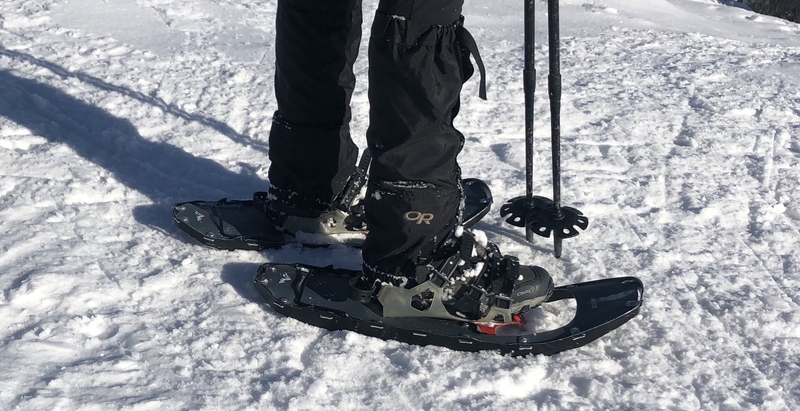 I wore them on a full day in the backcountry right out of the box. I don’t usually recommend doing this, but I was traveling and busy and didn’t have time to take them for a test run. They fit comfortably right away though, requiring no break-in time. Phew. It would have made for quite an uncomfortable day. Aside from the well-rounded insulation, these boots are optimized for winter travel and the accessories that go along with it. They worked with spikes, crampons, snowshoes, and gaiters. Nubuck upper, reinforced toe box, gaiter D-ring, lace webbing. Wide toe box: These boots do fit true to size, but you will notice more room in the toe box. Like I said above, this is appreciated both to accommodate larger socks (and toe warmers), but also to help avoid cramped, and therefore frozen toes. Waterproof: Oboz has a proprietary waterproofing system, comprised of a tape-sealed polyurethane bootie, hydrophobic upper materials with a DWR finish, and wicking lining to prevent moisture buildup inside the shoe. Winterized outsole and insole: I mentioned these above, but it’s worth reiterating. The winterized rubber on the outsole helps maintain traction, and the wool-padded midsole offers more insulation from the ground. Winterized rubber, hefty lugs. That’s some serious sole. Midsole: Lots of protection here, with EVA foam, and added support from a mid-foot chassis. Gaiter D-ring: Self-explanatory. Hook your gaiters over the ring to make sure they stay put. Very helpful. Reinforced toe box and heel counter: Added protection from trail obstacles and the the plummeting temperature, as well as increased support. 7″ height: This is less of a feature and more of just the model of the boot. I’m not much of a boot wearer, but on less stable terrain (and with a continually busted ankle) I am grateful for the added stability. 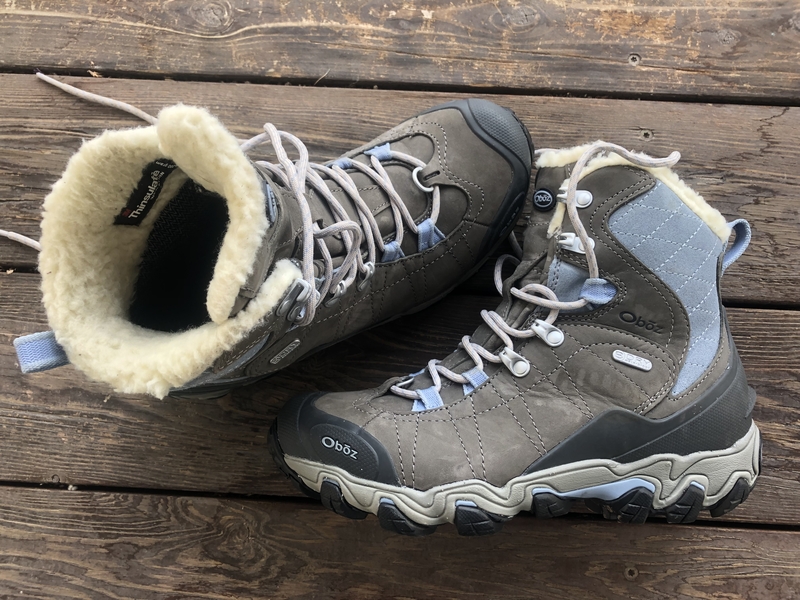 The fact that these are winter boots also means they have more cushioning around the ankle in the form of a piled fleecy material, so it never rubbed or felt pinched on my ankle. This is my first pair of burly insulated boots, and I’m a huge fan. 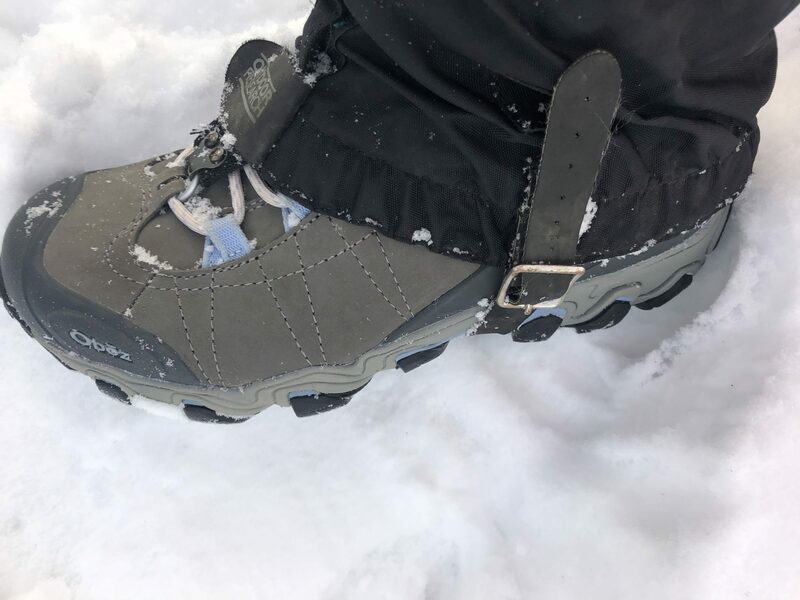 They fit snugly without constricting, my feet stayed warm on every outing I’ve been on, they feel secure, protective, and are optimized for extended hikes in winter conditions. Would highly recommend. The Bridger Insulated also come in a SUPER INTENSE 9″ model for places I will never go and excursions I will never do. If you’re looking for a three-season boot, the OG Oboz Bridger is a poplar option. The three-season boot comes equipped with the BDry waterproofing. Men’s found here. This item was donated for purpose of review.